CHANDIGARH, March 20, 2008: Today, a one-day national Seminar on ‘Making of India as a Nation: An Inter-Language Dialogue’ was organized by the Faculty of Languages, Panjab University, Chandigarh, at the English Auditorium of the university. In his presidential remarks, Prof. R. C. Sobti, Vice Chancellor, underlined the need of integrating language departments of the university under the umbrella of one school so as to facilitate a dialogue among the literatures that is produced in Indian and European languages. nationalisms in the first and third worlds. He spoke of the demise of the nation-state which is simultaneous with the rise of predatory capitalism which was resulting in a borderless world. He emphasized that the sweeping wave of ‘Theory’ can result in intellectual irresponsibility and takes away the one standpoint from where resistance is possible, which is of course the Nation. Professor Aijaz Ahmad, a noted Marxist scholar, agreed with Professor Shelley Walia’s views on the making of the nation and elaborated in his Inaugural address that the very idea of a unified Indian nation was suspect considering that Indian nationalism is governed more by constitutional imperatives than by a homogenous sentiment of nationalism. Civilizationally, India never had one language which could facilitate a transformation into an official nation-state. Quoting Ramanujan, he said that there was always a diversity within the classical, and the multiplicity of dissent within it did not allow Sanskrit to be its mother tongue. The very fact that women and the sudras were excluded from the Sanskritic order disallowed it to be the lingua franca of the nation. Tracing the lineages of the present, he elaborated upon the role of pre-nationalist reform movements and the contingencies of inter-communal tolerance as a pre- condition for nationalist struggle. Professor Ahmad thus ruled out the possibility of its communalization. Never had India encountered a potent threat of disintegration in the name of linguistic nationalism though there have been minor embarrassing violent backlashes. Professor Manager Pandey, former Professor of Hindi at Jawaharlal Nehru University, New Delhi, in his intervention, said that the contemporary Indian nation is undergoing a process of ‘unmaking’ rather than ‘making’.The myth of globalization which hinges around the rhetoric of double-digit growth rates and the volatility of the sensex conflicts with the reality of farmer’s suicides and the plight of people dislocated from their homes in the name of development. It is such disparities within that threaten the future of the nation. He emphasized on forging a forward-looking nationalism as against its regressive manifestation. coterminous with the various regional and linguistic nationalisms that characterized India’s freedom struggle. In the afternoon technical sessions, Prof. M. L. Raina, who chaired the session, spoke of foregrounding literature instead of just focusing on language in the imagining of communities that acquire national dimensions.Prof. Manjit Inder Singh from Punjabi University, Patiala, expressed the utmost need of making research interdisciplinary and comparative. Professor S. B. Sasalatti from Jawaharlal Nehru University, brought forth the centripetal and centrifugal pulls of language that are employed in the making of the nation. 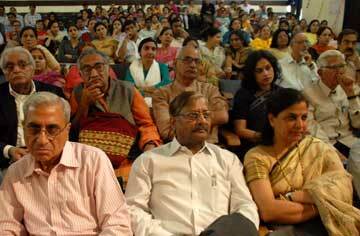 Professor Sankar Basu, again from JNU, underlined the significance of a continuous Indo-Russian cultural dialogue. according to Professor Shelley Walia, Dean Faculty of Languages, Panjab University.